Learning a new language can be really difficult, especially as an adult. There are countless programs and courses available online meant to help make the process easier. From DuoLingo to Rosetta Stone, each has it's own methods and gimmicks to keep it's users interested. When I took my first french class, the instructor told me that the first two semesters would be the most trying. Not through any fault of the language, but because the basics of any new language are difficult to keep engaging. InFluent, an independent game from Rob Howland and Emily Olmstead aims to keep the entire process interesting. 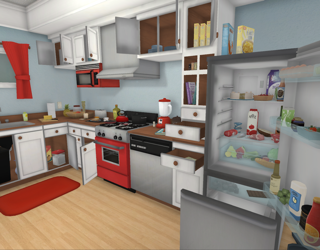 A classic adventure game, InFluent asks the player to assist inventor Andrew Cross. His device, a handheld language learning tool called the SanjigenJiten has been stolen and he needs help proving that the creation is, in fact, his. Players can explore their environment and click on almost any object to have the word displayed and spoken in the target language. Players are also able to see common verbs and phrases associated with the objects they select. By immersing the player in the target language, InFluent closely models the way we naturally learn our native language. Being able to play instead of slog is a real asset when learning a new language. InFluent does a lot to take the tedium out of the basics, making the whole process a lot more engaging and entertaining without being any less effective. 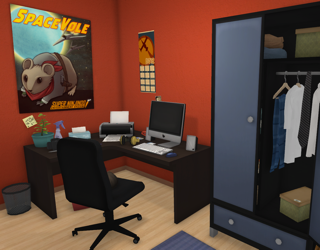 Currently, InFluent offers seven languages, including Japanese, English, French and Chinese. The base game is $10 and includes one target language of your choice. Additional languages are available for $5 each. If you've ever wanted to learn a new language but found traditional method slow or tedious, I suggest giving InFluent a try.